What is truth? Aristotle, Socrates, Plato and every great thinker who followed has pondered the question. In ancient Greece, it was a philosophical question, a debate of logic and ethics. In America in 2018, it’s a literal question, one that tries to determine what has been distorted and misrepresented. From Russian Twitter bots disseminating lies dressed up as news to doctored photos on social media dating apps, we live in a world where reality is blurred or outright missing from our daily lives. Unsane, the new film from Stephen Soderbergh (Ocean’s 11, Logan Lucky), is born of the paranoid modern world in which we live. Clare Foy (Queen Elizabeth II from Netflix’s The Crown) plays Sawyer Valentini, an upwardly mobile professional who’s suffering from PTSD-like symptoms caused by a stalking incident in her past. She’s cut herself off from friends and family and relocated to a new town with a new job in an effort to give her disturbed pursuer the slip. When Sawyer tries to obtain psychological help for her anxiety, she casually admits that she has contemplated suicide in the past, and the wheels of involuntary commitment kick into gear. Sawyer sees her stalker everywhere, but Unsane cleverly withholds any corroboration of Sawyer’s point of view. We only have her word for the trauma she has endured. She’s surrounded by co-workers who simply know her to be the person she claims to be. For the first half of the film, your belief in Sawyer’s plight is a psychological teeter-totter. In one scene, she’s clearly the victim of trauma. In the next, you wonder if she’s mentally ill, seeing imaginary persecutors around every corner of her every day life. 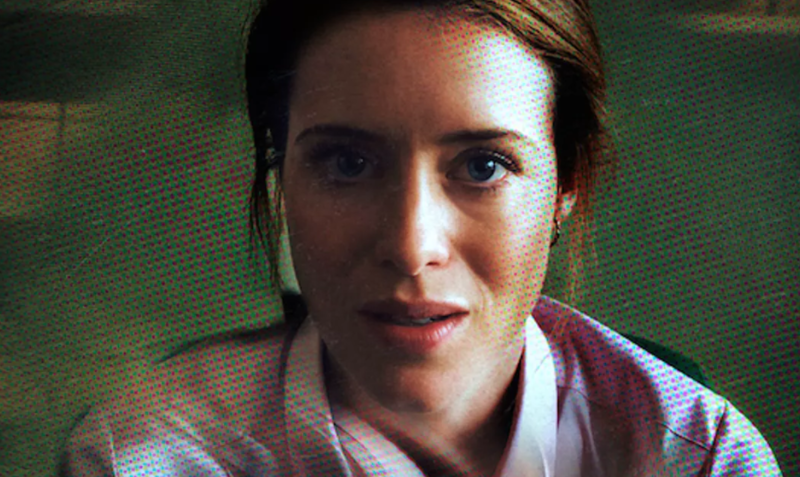 With Unsane, Soderbergh has crafted a thriller that is sure to become a Netflix favorite, one of those little surprises that’s so much better than you expected it to be. (If only casual movie lovers could discover it in theaters, so the filmmaker could more readily find the funds for his next project.) But, under its crafty surface, Unsane plumbs the depths of sexual harassment and victimhood in this #MeToo era. In one scene that doesn’t involve a possible stalker, Sawyer’s work is being praised by her superior. Her pride quickly drains from her face as the compliment comes with an invitation to attend a professional conference in New Orleans for a few nights. Just her and her male boss with possible advancement in the company hanging in the balance. To her boss, she’s a piece of tail first, and a business woman second. Only she doesn’t have a spotlight to shine on her situation like the celebrity victims currently populating the national news cycle. Instead, she has to collect herself in the ladies room and get back to work. The moment gives context to the entire film. Fear doesn’t have to take the form of a crazed stalker. Evil may simply inhabit the corner office at work. Sawyer finds herself in restraints in the mental hospital, but at least those shackles are apparent, obvious. The limitations placed on her career are invisible, a subtext that can be denied later if need be. Much has been made of Soderbergh shooting the film on an iPhone. It’s not the stunt that the mainstream press makes it out to be. The low-fi look of the cinematography is in perfect sync with the subject matter. Sawyer’s world is muted, dulled, soft around the edges (like her sanity?). The filmmaker can still frame a shot better than damn near anyone, conveying information through his visual compositions. Soderbergh’s gravest mistake with Unsane is making it look too easy.